MONTREAL (AFP) - US and Canadian negotiators were holding eleventh-hour talks on Sunday aimed at revamping the North American Free Trade Agreement ahead of a Washington-imposed deadline. 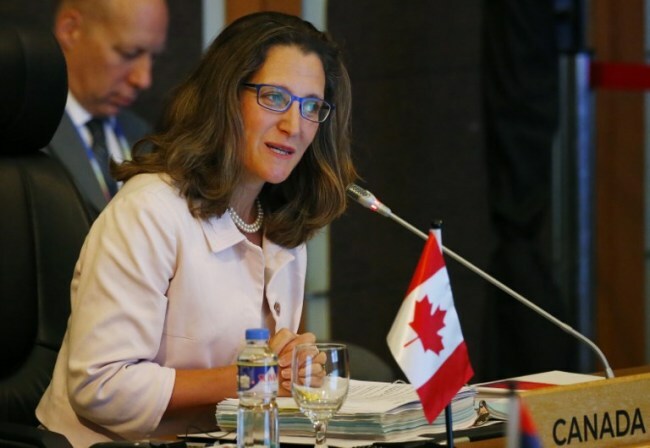 The talks were being held over the phone, unlike in previous rounds where Canadian Foreign Minister Chrystia Freeland had traveled to Washington. "Lots of progress, but we're not there yet," David MacNaughton, Canada's ambassador to the United States, said in Ottawa before heading back to Washington on Sunday evening. Peter Navarro, an adviser to US President Donald Trump on trade, earlier told Fox News: "Everybody is negotiating in good faith right now as we speak. The deadline is midnight tonight to get the text into Congress to make sure this goes forward." Canada's The Globe and Mail cited sources on both sides of the border as saying a deal was close. Most of the "substantive work" has been completed, with a "handful" of details remaining, the newspaper reported. The United States and Mexico want to push a deal they separately negotiated through their respective legislatures before Mexican President-elect Andres Manuel Lopez Obrador takes office on December 1. In the United States, Congress must have the text of the deal by Sunday if a 60-day review period is to be respected. Trump has been pushing for a complete overhaul of the 25-year-old trade deal, which he says has been a "rip-off" for the United States. Speaking at a political rally in Wheeling, West Virginia on Saturday night, Trump told supporters: "We'll see what happens with Canada, if they come along. They have to be fair." In August -- more than a year into the negotiations -- the United States and Mexico announced they had reached a two-way deal, after breaking away for bilateral talks on their outstanding issues. But the ensuing talks to incorporate Canada have stumbled. Ottawa and Washington remain at odds over Canada's managed dairy sector, and the dispute resolution provisions in NAFTA. But concessions on dairy would be politically difficult for Trudeau's government, a matter complicated yet further by elections being held Monday in the key dairy producing province of Quebec. The main Quebec parties and farmers' organizations are in favor of retaining the "supply management" system, which controls the production and price of milk and poultry and ensures stable incomes for Canadian farmers.